Our family revels in tradition. We're talking Valentine love notes, Leprechaun hunts, Easter eggs, end-of-school-year parties, summer traditions, back-to-school parties, Halloween themed dinners, pies as far as they eye can see at Thanksgiving, and a huge annual "Holiday Kick-Off" each year complete with a special dinner, gingerbread house making, a viewing of Elf, and holiday jammies. Having grown up with what I would consider an enchanted childhood, I'm doing my best to provide my kids the same thing. As much as I love (over)celebrating everything, I've become weary of "stuff." As a mom, I catch myself attempting to instill values dissociated with THINGS. "Stuff doesn't make you happy, people make you happy," and "People are more important than things..." As a family we're attempting to build relationships and memories rather than a focus on material items. I asked my kids recently to provide me a list of things they'd gotten for Christmas and birthdays over the last few years. While they did recall a few things, their lists were short. I then asked them to tell me about a few adventures we'd had as a family. Can you guess the results? Their memories were amazing! 1. 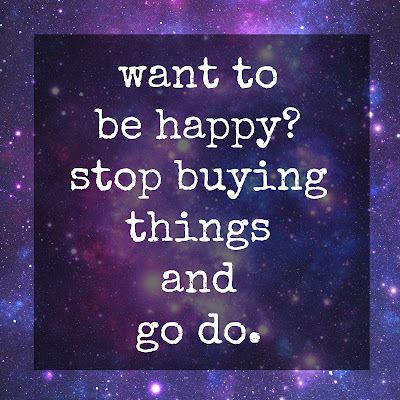 Happiness from "stuff" is temporary. Literally. "One of the enemies of happiness is adaptation. 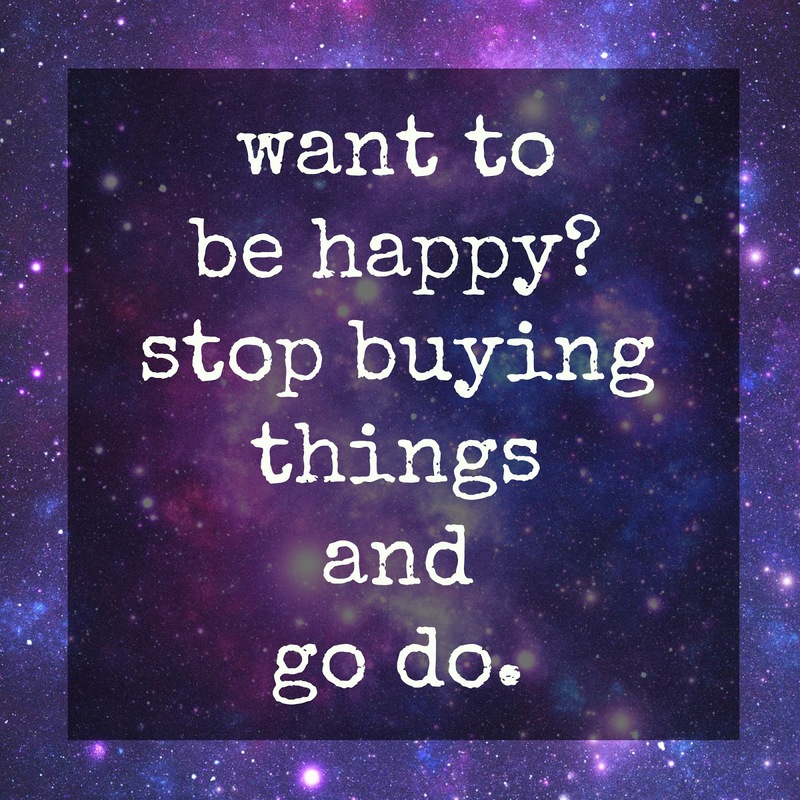 We buy things to make us happy, and we succeed. But only for a while. New things are exciting to us at first, but then we adapt to them." says Dr. Thomas Gilovich, a psychology professor that has been studying money and happiness for over 20 years. He argues that money can buy us happiness, but only to a point. 2. Experiences become part of you. The things we own don't define us, but our experiences, (both good and bad) make us who we are. We are the sum of our total experiences so why not try to have as many positive adventurous experiences as possible? 3. Shared experiences bind us. We all have inside jokes with those we're closest to. Challenges, journeys, adventures, experiences - when shared, they make us feel more connected to one another. The equation here? 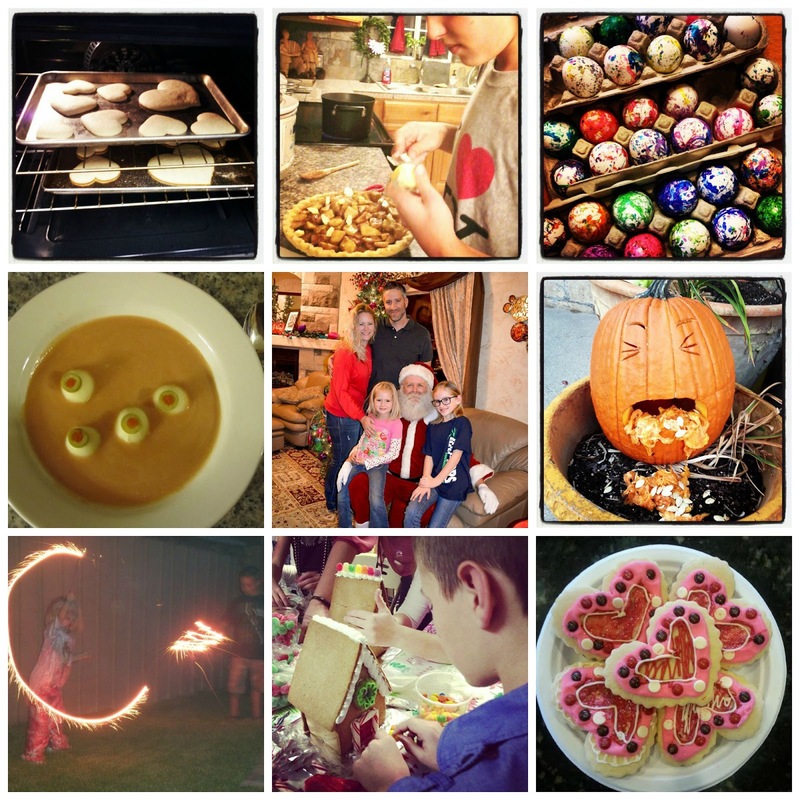 Create more shared experiences and you'll get more bonding time as a family. As a parent, I want my kids stepping into their adulthood with a strong sense of belonging and with elaborate memories of navigating the ups and downs of all of our family adventures, and I want to provide them as many opportunities as I can to do just that. With our new family focus this year on these ideals, we've planned an epic #FamilyForward adventure with the folks of Mom It Forward and Family Forward. We'll be spending a long Labor Day weekend at the Loews Royal Pacific Resort at Universal Orlando. Family Forward's aim is to give families experiences, ideas, and skills to embrace bonding in this digital age. Check out how other bloggers are doing it by following the #TravelForReal hashtag online. Traveling 2,500 miles with 3 kids ranging in age from 6 to 16 over a span of a week with one hotel room and a very full schedule is inherently going to be exciting and challenging. We'll feel every single emotion in that span of seven days, but most importantly, we'll be feeling those together - as a family! It will be impossible not to make life-lasting memories. 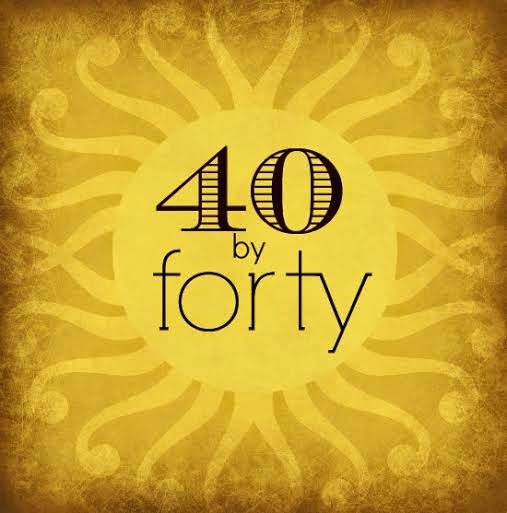 I turned thirty-five a few months ago and figured now that I'm officially all grown up, I better start figuring ways to maximize the last half of my thirties. Why not push the limits a little? This list is a compilation of goals that I've set for myself. Think I can pull this off? Am I missing something I need to add on? Attend my 20 year high school reunion in Chesapeake, Virginia in 2017. Take a belly dancing class. Do a volunteer/humanitarian project in another country. Public speaking in front of 1000 people, minimum. Go on a cross-country (or close) road trip. Go on a multi-day backpacking adventure. Learn how to lay brick. Meet someone I've always dreamed of meeting. See a whale shark (and/or swim with one). Organize a substantial sub-for Santa project for a family in need. Plan one week of Random Acts of Kindness. Organize an event for a children's hospital. Enter art in an exhibit. 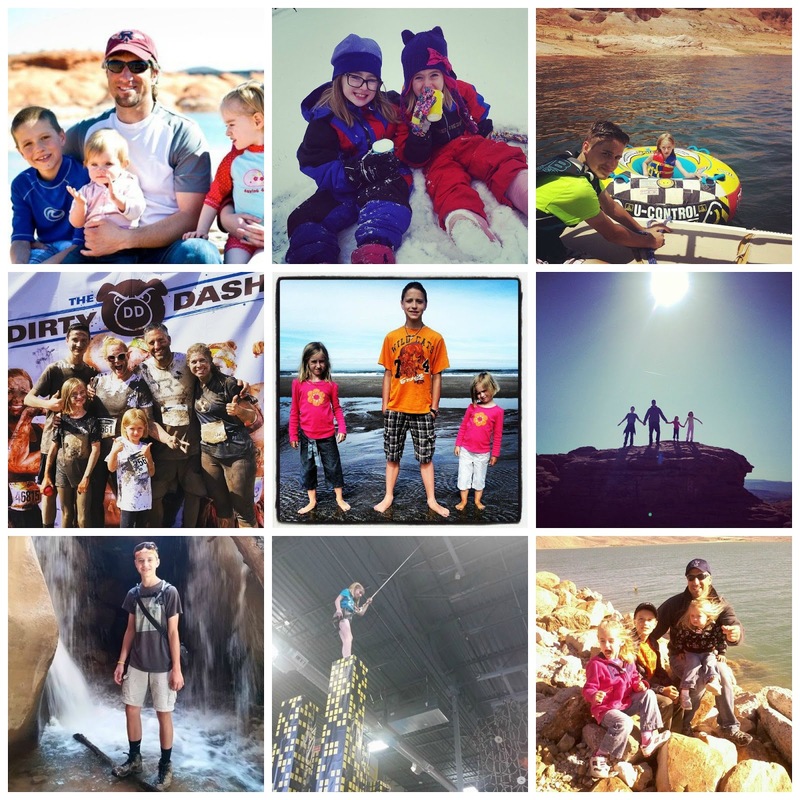 Take a family vacation in a houseboat at Lake Powell. Take the kids to Disney World. Make a stained glass window for my own home. Help design and build a float for a parade. Attend a taping of Jimmy Fallon or Saturday Night Live. Social media and social media marketing have been a substantial part of my life for almost eight years. As a result, recently I was invited to share some thoughts on social media with Brigham Young University's marketing and advertising students at their AdLab. 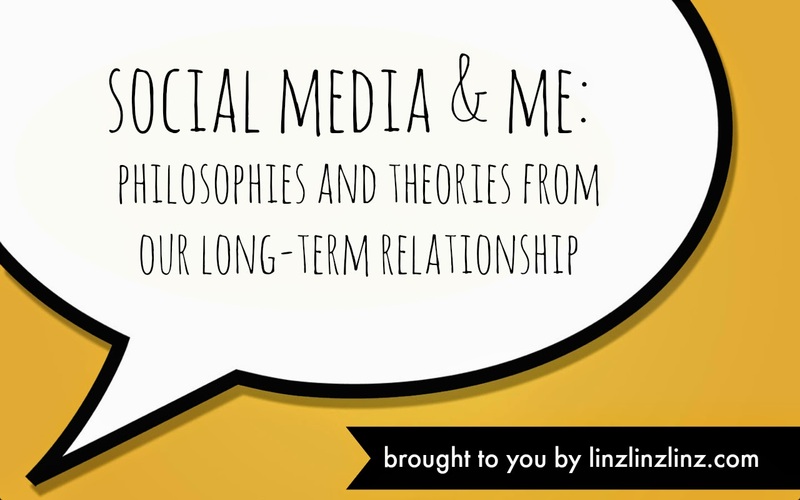 With an added layer of pressure resulting from the opportunity to present to the bright future of our social channels, I decided to touch on some personal (and business) social media theories and philosophies, or general best-practices, rather than they step-by-steps they may have been expecting. After much thought I decided that if I was going to truly represent the parts of social media that I'm most passionate about, this was the very best way to do this. Want to truly grasp social media and position yourself as an expert? Here are my simple suggestions. Sound harsh? Unfortunately for 96.5% of the general population, we don't know as much about social media as we think we do. Myself included. This became apparent to me in 2011 when I left JetBlue after helping pioneer their Social Media Team. I was naively confident for a short time and considered myself a Twitter expert. When jumping into social media for other brands and organizations I realized that I'd really only been an expert in a couple of things - making cheeky comments and understanding the logistics of the Twitter platform, itself. Don't get me wrong, there was probably more to what I was doing than that (I hope), but what I'd learn didn't translate into every avenue like I hoped it would. I learned a valuable lesson in that transitional time, one that I never again let slip my mind. Just because you champion a social space or two, for one brand, doesn't necessarily mean you can do it again, at least without a lot of trial and error. Social media is no one-stop solution and most certainly isn't a plug-and-play operation. Never ever underestimate the value of really learning the 'ins and outs' of every platform from as many different perspectives as possible. Every platform is different within every industry and between every organization. That's an exponential number of variables. Best-practices and social media strategies (even this one) are suggestions, not guidebooks for instant success. Social media changes daily, sometimes even hourly. What you know today may have to be different tomorrow. Stay on top of it. Every single job I've had in the last 5 years (at least) was given to me with a qualifier. "We've never really had anyone in this position before...." or "We've played around in these spaces but we haven't really had a strategy or a personal designated to facilitating things." These are all things that often accompany jobs that incorporate social media positions - at least in our current times. If you're working in social media, or considering a future there you need to quickly embrace that there is no standard or traditional path to follow. Be prepared and be okay with paying your dues. So many passionate social media strategists are also tasked with converting others (even their own leadership) to the ways of the medium. 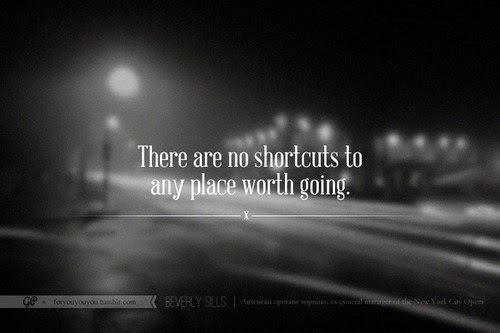 Be prepared to carve your own path. It's likely that you'll need to. Beginners - don't expect to step into high paying jobs until you have some solid (and extensive) experience. Make the most of your internships. Work your way up. Prove your worth with your passion for the space. It may take longer than you wished it would. Get scrappy and work your way through it. It's totally possible. If you haven't noticed, social media doesn't sleep. Get used to almost working around the clock. It may be addicting and charming at first, but eventually you'll realize that you'll need to harness a solid work-life balance. Find it sooner than later. I'm not confident that there are many jobs out there that are strictly social media. Anticipate that you'll have much more on your plate than just that. Give. Give. Give. It may seem simple, but going the extra mile becomes especially convenient when digital - so plan on going the extra ten or twelve miles. If you find yourself as the voice for a brand, it's likely (or seriously hopeful) that you'll have some level of passion for the product or service they offer. Guess what? It's not likely that everyone else will share that same passion. Want to truly connect and spread your message? 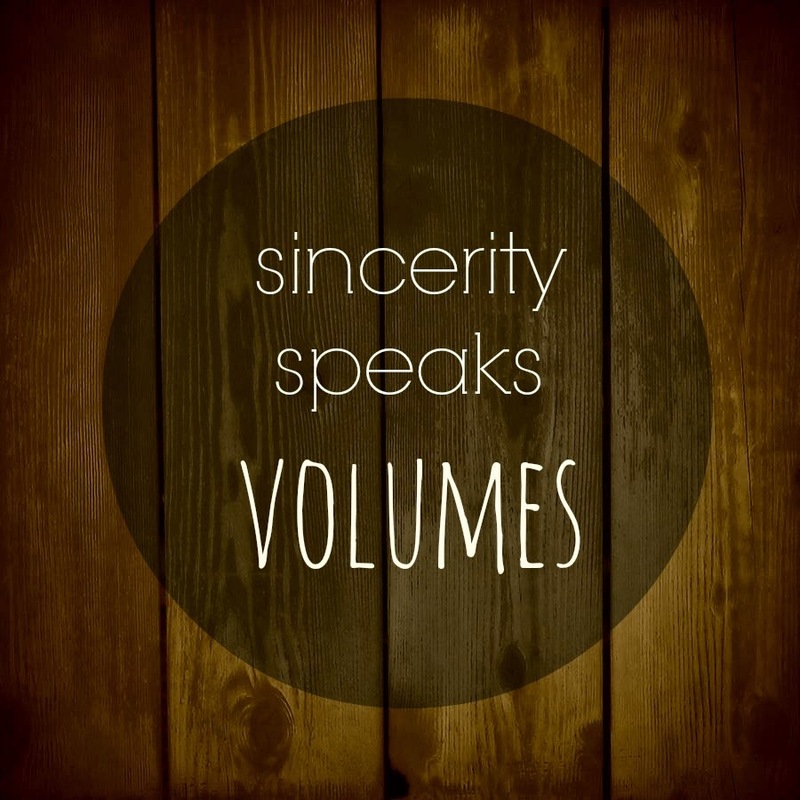 Sincerity speaks volumes. No matter how often you hear experts preaching the importance of SOCIAL in social media, we easily forget how much noise exists in each platform's space. We promote and attempt to broadcast our brand message just assuming that others will accept it with the same resolute passion we have shared it with. How easy it is to forget that those most successful in social media have found a way to connect their message with emotions that resonate with the masses. Craft something relatable. Be human. Be funny. Be clever. Be fresh. Be yourself... unless you're a billboard, then be someone else. People are smart. If you're out there in these social spaces strictly to be seen, people will know, and you'll be wasting your time. It seems like a no-brainer, right? It may sound corporate but what so many don't realize is that everyone is already creating their own brand with each and every social post that's shared out to the interwebs. Beside the simple logistics of attempting to claim all of your vanity URLs (or matching handles for each platform) there's so much more to truly understand with personal branding. Be smart about it. Remember what we talked about in the section just above this one? 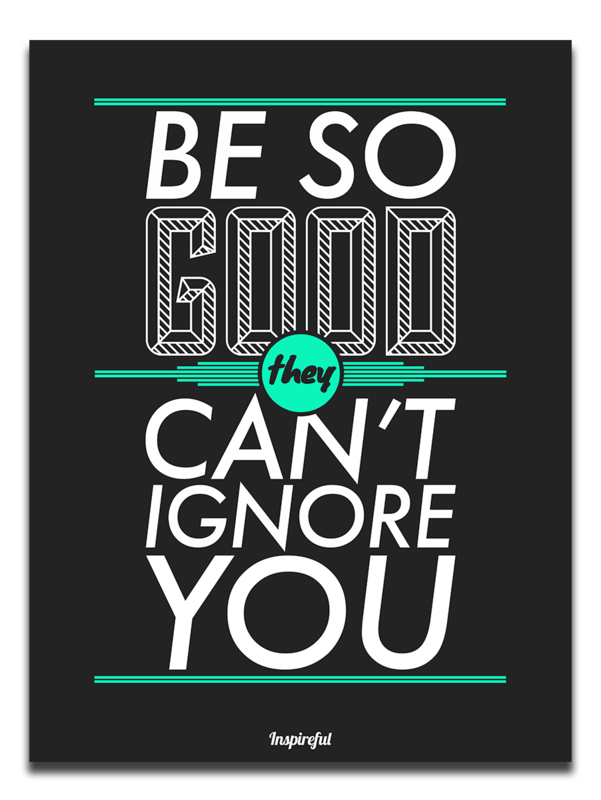 Don't just promote yourself. Find things to share that enrich the lives of those that consciously chose to follow you. Want to be considered a 'social media expert'? Then prove it in your own spaces. Work with an abundance mentality. Social media is all about sharing. Learn something new? Figure out a trick or two? Spread the love. There's enough out there for everyone. 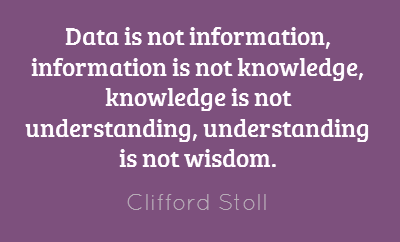 Be the first person to share your knowledge - and do it proactively. Use proper grammar. Spell things properly and use punctuation. Pretty please? If you think you should be able to do or say anything you want on your personal profiles, adjust your privacy settings. Don't put anything out there that you don't want the entire world's population to see. Save the drama for your mamma. Yeah, you know what I mean. School ended Friday at our house. I successfully navigated the day without disappointing the excited kids in my life, but the day ended with an increased awareness that I had no viable plan to make it through the next 79 days without feeling like some sort of less-adequate parent. Being a working mom is a challenge. Being a working mom that mostly works from home proves at times to be even more of a challenge, most specifically during the summer months. There's definitely a learning curve each year for all of us. As I sit back and realize that summer vacation officially starts at my house tomorrow, I decided to create a quick plan of attack so I'm approaching the months with a brighter outlook and a more defined (but still incredibly loose) schedule. I'm not gonna lie. Even putting together this loose of a plan has me a little intimidated since I have a deep love for flying by the seat of my pants (even now more than ever) but I feel like with this outline, at least I have a chance. Need some ideas? I love that with an outline like this you can plan activities that take anywhere from 30 minutes to 4 hours. Figure out what fits into your schedule for the day and pop it into your itinerary. Mondays: Art projects, simple crafts, cooking projects, or basic meal prep. Maybe on Mondays you even let the kids make lunch for everyone. Tuesdays: "Take a trip" to a local park you don't visit, take an extended walk, hike a local trail, or visit a local kid hot-spot. Wednesdays: Fill up the kiddie pool, run through the sprinklers, turn on the hose and let the kids wash your car, or even just arm your little ones with water guns. My kids may even get lucky and find themselves at a local pool a couple times this summer. Thursdays: Browse Pinterest for a couple quick and inexpensive science projects, visit the library, or even print some age-appropriate workbook pages. Fridays: It's time for friends! Make some cookies, organize a simple afternoon picnic, or order a pizza. Sometimes it's easier to streamline all major 'play dates' into one day of the week so your kids are begging for elaborate events every single day. Think this may come in handy for your family, too? Feel free to download a PDF version of the Summer Schedule here. Today I'm spotlighting my lovely mom, Dea Miller, as it's her 70th birthday. 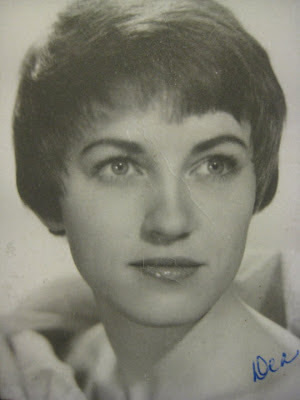 We've always had a special relationship, and she's been an outstanding mother and grandmother. 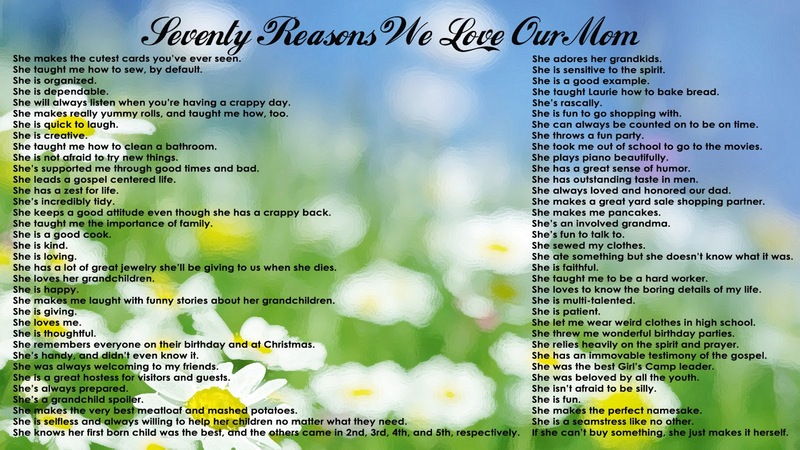 To celebrate her life my siblings and I put together a list of 70 of the things we love about our mom - obviously, there are far more than 70, but this is a start. There's something truly romantic to me about the thought of purchasing produce directly from the source. I love knowing that the values the farmers hold dear, are similar to my own and that the care taken would be similar to my own as well. If this overview has peaked your interest, like I'm truly hoping it has, there are several ways to get involved with the amazing folks at La Nay Ferme. You can start by becoming a member of their CSA, or community-shared agriculture program. Doing this provides you an opportunity to purchase their produce on a 12 week, 4 week, or even a weekly basis. If that commitment is a struggle for you, or if you just want a peek into what's available from the farm, you can even consider purchasing from their on-site Market. You may also want to consider taking a tour of the farm. The beauty of the scenery is unmatched and it's inspiring to see first hand the work and care being put into this project. Not to mention the fun promotion you can partake in if you get over there this month. Additionally, keep an eye on their Farm to Table Dinner schedule. It's nothing like you've ever done and something you'll want to do as soon as the weather warms up. So, wanna win a weekly share? Yes, yes you do. Enter via the myriad of options below. 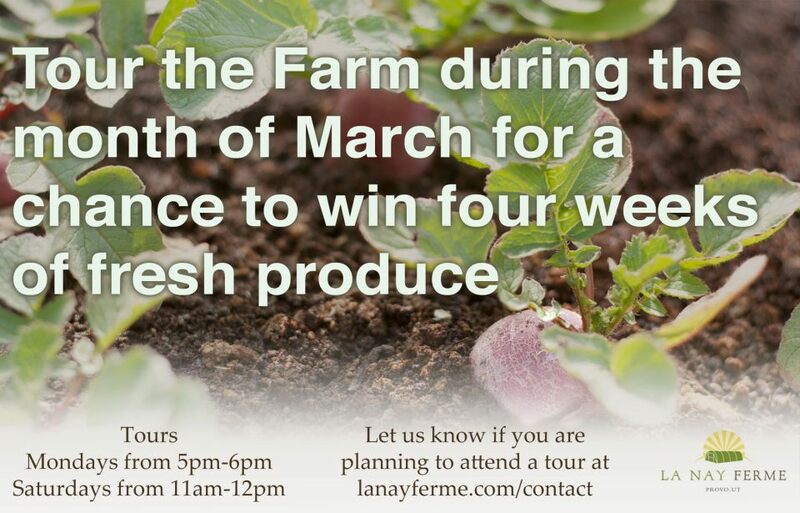 Winner will be awarded one week's share from the La Nay Ferme CSA program, valued at $29.87!